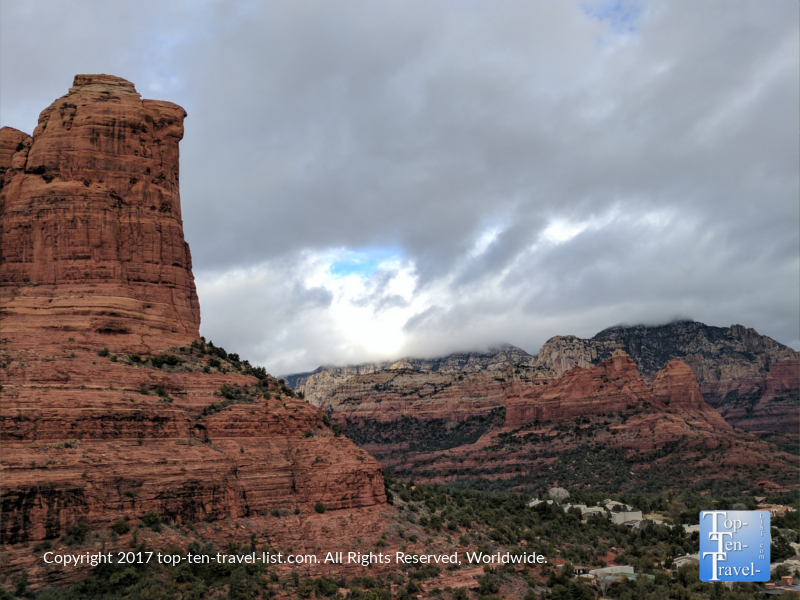 5 Amazing Sedona Hikes Under 5 Miles - Top Ten Travel Blog | Our experiences traveling throughout the US. Sedona, Arizona is a gorgeous Southwestern vacation destination, and by far, the most beautiful place to visit in Arizona (yes, above the Grand Canyon!!). 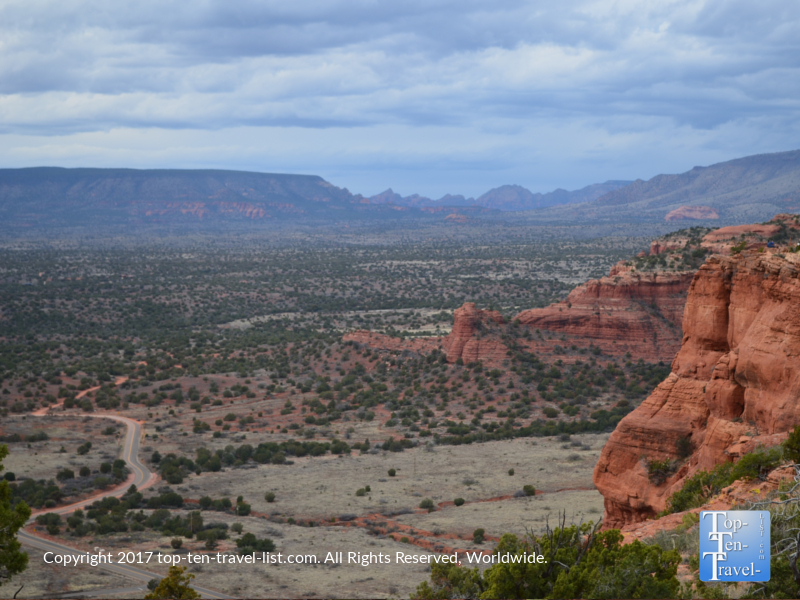 Towering ancient red rock formations dominate the landscape, and through various means including scenic drives, hikes, spectacular overlooks, tours, and even restaurants & resorts, you will be able to enjoy these extraordinary views. Although a diverse assortment of over 100 miles of trails are to be found, the majority of the most scenic hikes are easy-moderate in intensity. 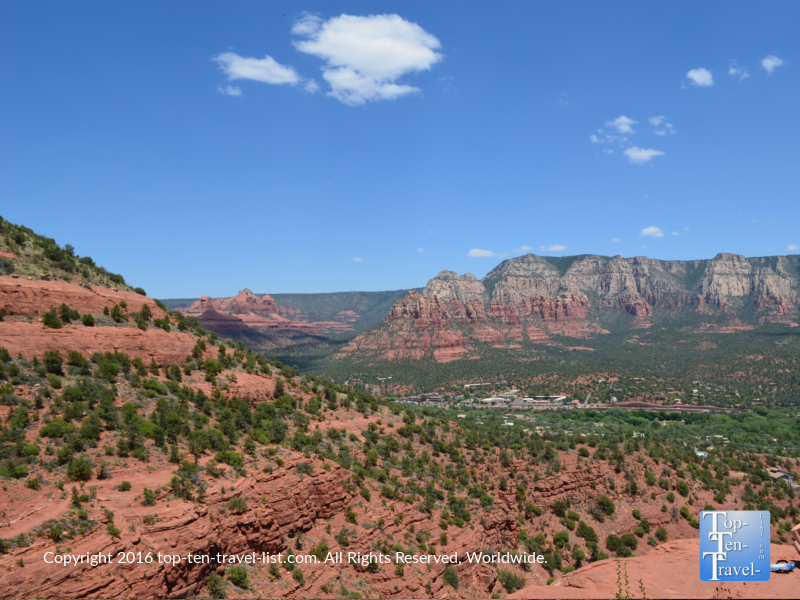 If you are looking to keep it simple & short, yet still enjoy the breathtaking red rock scenery, you are in luck as Sedona offers a lot in the way of short and scenic trails. Below are my top 5 Sedona hikes under 5 miles. 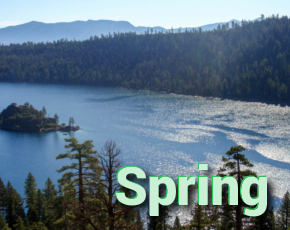 Doe Mountain is a moderately challenging hike which involves a short & steep climb up to a scenic mesa. This underrated hike offers some of the biggest views, with minimal effort required. Although the trek involves a series of steep switchbacks, the total distance is just 0.7 miles each way, and the views at the top more than make up for the great cardio workout. The trek up is a bit scary as there are some pretty steep drop offs (this trail really is not recommended for those scared of heights! ), although well worth it in my opinion for the spectacular red rock vistas. The panoramic red rock views from the summit are so incredible – few hikes offer this grand of a view for so little time and effort in return. Once you get to the top, you can walk around, check for signs of wildlife, and enjoy unending photo opportunities, all in a really quiet setting away from everything. Really, hiking Doe Mountain is one of the must-do’s for any regular hiker visiting Sedona. 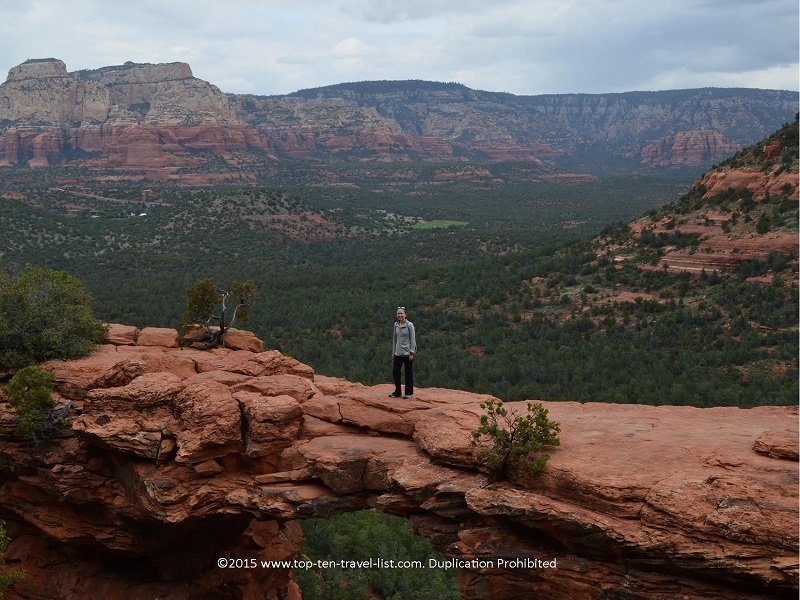 Devil’s Bridge is one of the most used of Sedona trails and for good reason! A short and mostly flat (asides from a short steep climb near the end) trail leads you to Sedona’s most striking feature: the largest sandstone arch known as Devil’s Bridge. The arch is quite a sight to see, although walking across it is even better! Assuming you are not scared of heights (there is a very steep drop off), walking across the arch and having someone take your pic on the other side is the must-do in Sedona. Luckily, people are very friendly here so you should have no problem finding someone nice enough to take your photo! Challenging yourself to walk the arch is an exhilarating experience, and the resulting pic, the perfect free memento to take home with you! The bridge is actually not as narrow as it looks from pictures, however, you’ll have a blast showing friends and family members your big feat. Despite being crowded pretty much the entire year and the hassle of finding parking (arrive early! ), Devil’s Bridge is well worth considering for the breathtaking views and unique opportunity of walking across the largest sandstone arch. Note: If you do not have a high clearance vehicle, you will need to start on the Mescal/Chuck Wagon trail, adding about 2 miles to your total distance, for a total of around 4 miles. Don’t worry as the mile or so journey along the ChuckWagon/Mescal trail is very scenic, easy, and peaceful! Location: Drive to Dry Creek Road and turn right at the stop sign onto Long Canyon Road. Turn right and drive 0.2 miles to the Mescal Trailhead on the right. Use the Mescal-Chuckwagon trail connection to reach Devils Bridge Trailhead. Airport Mesa is a pretty unique choice to add to your Sedona hiking bucket list. First off, the scenery is really spectacular. The views are really jaw dropping particularly during the first section of the trail, although the very steep scary drop offs might be too much for those afraid of heights. Prominent red rock formations surround you in every direction and the trail is pretty peaceful and quiet. Second, the desert plant life here is extraordinary, with dozens of healthy bright green prickly pear lining much of the trail (on the contrary, most cactus are dead and brown on other trails). Third, this hike is considered to be one of 4 vortex hikes. In Sedona, a vortex site is said to possess special energies, due to a high concentration of energy naturally swirling up from the earth. As this is a New Age theory, there really is no proof, although many claim to feel a sense of peace or healing after visiting these sites. 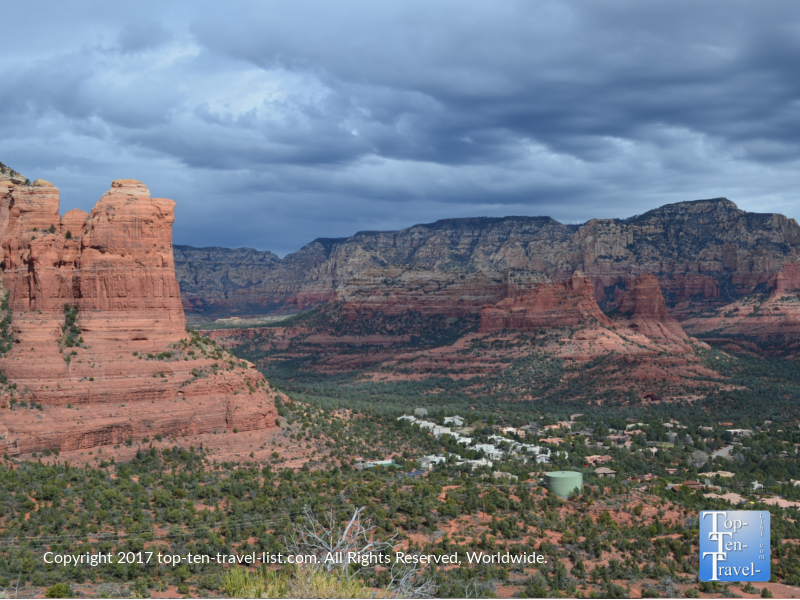 The entire Sedona region is technically a vortex, however, the 4 hikes are said to be areas of concentrated intense energy. Lastly, Airport Mesa is one of the top spots in towns for a sunrise/sunset, so before or after your hike you can treat yourself to another wonderful view! The magnificent Teacup/Sugarloaf Summit loop is so beautiful, peaceful, and conveniently close to Uptown, yet still somehow forgotten. This is quite a shame as the views here are simply out of this world. 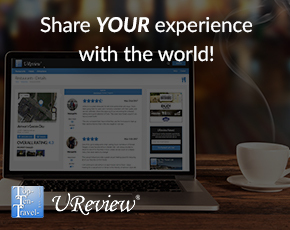 For jaw dropping scenery like you have never seen before, this great little loop is the way to go. And to think that these views are so easily accessible, by way of a relatively easy trail is just crazy. Most of the trek is very easy and relaxing with ongoing views of dramatic rock formations including the towering Coffeepot rock (named as so as it resembles a French Press). Combining the Teacup with the Sugarloaf Summit (a short 0.3 climb to a breathtaking overlook) adds little to your total distance, yet rewards with even more stunning panoramic views. You think the views could not possible get any better, that is until you stand up on the summit and take in the wonderful red rock views around you. This hike is so amazing that it is one of just a few that I deemed spectacular enough to do twice. 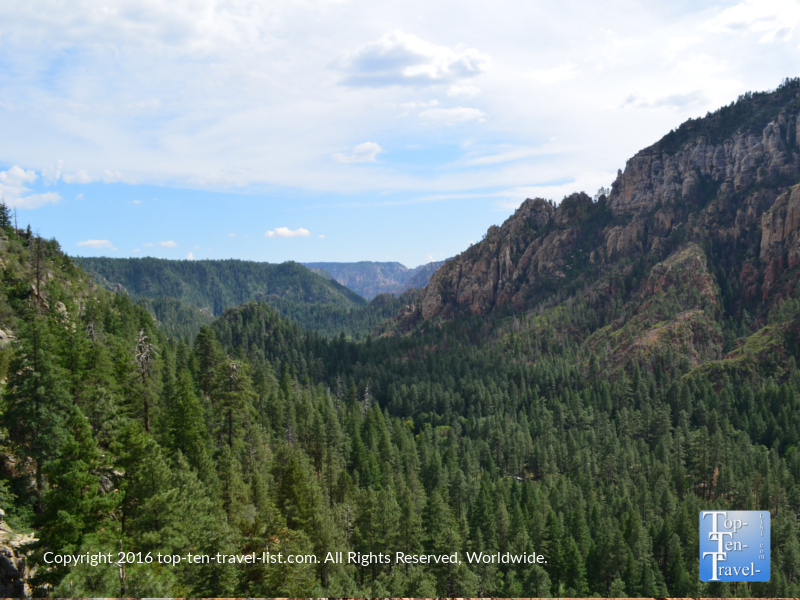 While Sedona is most well-known for its’ towering red rock formations, the dramatic cliffs and pine loaded forests of beautiful Oak Creek Canyon are just as incredible. Oak Creek. The drive along Oak Creek leads you through a variety of incredible landscapes including various colorful rock formations, tall ponderosa forests, and even deciduous trees which turn beautiful hues of red and yellow come fall. Oak Creek is home to a diverse variety of plant life, and thus, offers quite different views than Sedona. Due to the extreme elevation changes (4000-7000 ft), you will get to witness the scenery change from green pines to stunning red rocks. There is a gorgeous trail along this drive which is overlooked as tourists either complete the nearby West Fork or head straight to Sedona to hike the red rock trails. While the red rocks are stunning, the pine tree vistas along the Cookstove trail are just incredible, if not more so. A short (just 0.7 miles), yet very, very steep climb will lead you to the most stunning overlook, which looks down upon the entire canyon area. This is one Sedona trail which you will have entirely to yourself! As it is sort of hidden along Oak Creek Canyon, not nearly enough tourists take the time to check it out. The hike remains a peaceful hidden gem.